Just three weeks out from the Clipsal 500 in Adelaide, Peters Motorsport and Multispares made a change in direction. 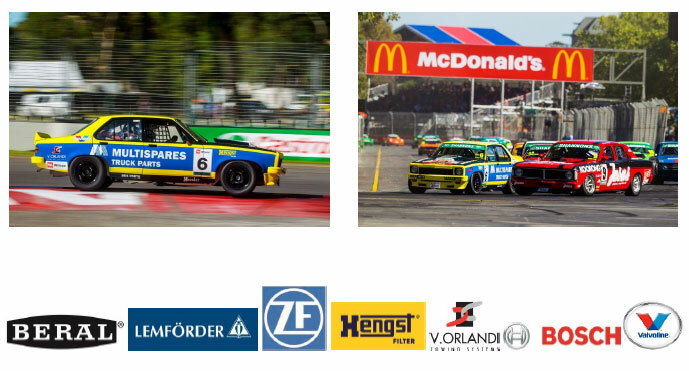 After racing in the Australian V8 Ute series for several years, they decided the popular Touring Car Masters series (TCM) was a perfect fit for the team, Multispares and most importantly the Multispares customers. With little time and TCM cars for sale they settled on the ex Carey McMahon Torana SLR5000. The Torana was transported back to Brisbane from Sydney, and with 10 days to go, checked over in the workshop, then tested at Queensland Raceway, given a new look thanks to vinyl wrapping rather than painting and loaded into the transporter early last week for the trip to South Australia. Practice went well with a 2nd and a 3rd fastest which certainly opened a few eyes. Most competitors had heard of Ryan Hansford but with the exception of John Bowe and Steve Johnson (who had followed Ryan having known his father Gregg) didn’t realise just how fast he was. Heading into qualifying, Ryan was still not feeling comfortable in the car, being quite cramped, so he kept a little up his sleeve. He was 3rd fastest behind Johnson and Bowe, which given how few laps he had completed was an excellent result. TCM has rolling starts so for race 1 Ryan got away well but 4th place qualifier Adam Bressington snuck through into 3rd. Ryan pushed him hard and had several attempts at passing but really wanted to finish race 1 and certainly didn’t want to damage the glorious Torana. For race 2 Ryan lined up 3rd again after finishing 3rd in race 1 after Steve Johnson didn’t finish race 1. This time Ryan got a great start, but a bolt sheered in the front end after he had to jump the turn 1 chicane after getting pushed wide. With the bolt broken, a bracket followed and then the steering arm, so Ryan had no choice but to park the Multispares Torana. Race 3 in TCM is called a “Trophy race” where you get 25 points to start and 25 points to finish, but it is reverse grid. Ryan lined up 18th, so he had his work cut out. At the first chicane there was a big crash with 4 cars involved. Ryan just snuck through without damage and as the field rolled around behind the safety car he was in 11th with John Bowe and Steven Johnson right behind him. At the restart with 4 laps remaining Ryan not only kept the two more experienced drivers behind him but was making brilliant overtaking moves, and at the finish he had got away from Bowe and Johnson, and finished 3rd overall and posted the fastest lap of the race.